Some of you familiar with my previous blogs about the situation in my home country may still remember the reference that I made a couple of weeks ago to a potential interview with the Georgian Ambassador to the United Nations. After a few attempts to “catch” Mr. Alasania in-between his meetings and Security Council discussions to do the interview while the issue is still very much in the headlines, I finally got a chance to sit down with him at the UN Radio HQ this morning for a tete-a-tete dialogue about the current situation and what’s in hold for Georgia and its two breakaway regions. Although the interview airs on PRN (the NY-based radio station where I do my weekly show broadcast from the UN) and UN Radio this week, you can catch my private upload streaming right here…..
Quite a different side of Tinatin, I suppose… minus the dance beat 🙂 Would really love to hear what you think, if you get a chance to have a quick listen!! What a month it’s been so far, trying to juggle everything at once – the UK/Canadian promo of “Thinking of Someone Else”, preparing new club remixes of the song as a bonus track for the single, researching and following the ever-so escalating conflict back home which has gone way beyond a Geo-Russian dispute, in fact, covering the news at the UN with a a particular focus on this issue, and so on…. So much to do, and since the summer is almost over – there’s only so much time for a bit of fun! 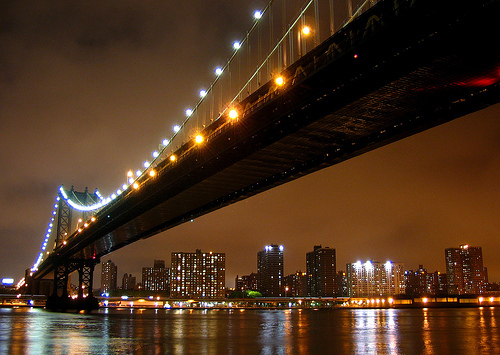 Last night was a perfect opportunity to escape the reality of a political world – sailing across NY’s Eastside with live music and a great company of friends and colleagues – what more could you ask for? Well, it certainly didn’t help waking up this morning with a piercing pain in the throat – no singing for me today, that’s for sure! So what do you do instead on a beautiful Thursday afternoon with a sore throat and a bit of a headache (no, no, I only had a couple of glasses of Captain + Coke) – right on the verge of getting sick? I spent an hour or two in the heart of Central Park… reading today’s newspapers and preparing for my radio show! Not glamorous, perhaps, but so relaxing, nevertheless. Oh, and my iPod helped immensely as well – new ideas on the way and all that…. Not as good as a proper holiday, but still rather soothing for the soul! I’ve spent the last few months reading so much about Russian history and particularly the Soviet era, I realized the other day that I’ve been neglecting entertainment and fiction for a while now, so I just picked up a funny book called “A Waiter’s Rant” – absolutely hilarious. So this book, alongside my other current read, “Why Did the Soviet Union Collapse?” (doesn’t sound too entertaining, does it? Haha) and the iPod – can’t complain! Here’s to the upcoming long weekend!!! First of all, thank you so much to each and every one of you for your warm support and prayers at this difficult time for my home country of Georgia, that I so value and appreciate it. I have read every single message and comment from you and am so touched by your words. As you have shown so much interest and genuine care for what is happening at the moment in Ossetia, and although many of you will understand where my heart truly lies at this very tough time, I have decided to share these two very opposing and varying opinions about the current situation and the conflict itself, therefore giving those of you interested in the story a more or less two-sided picture as of now…. BEIJING (AP) — President Bush on Monday sharply criticized Moscow’s harsh military crackdown in the former Soviet republic of Georgia, saying the violence is unacceptable and Russia’s response is disproportionate. The United States is waging an all-out campaign to press Russia to halt its retaliation against Georgia for trying to take control of the breakaway province of South Ossetia. The crisis over South Ossetia appeared to ebb as Georgian troops began retreating and honoring a cease-fire, a claim Russia disputed. U.S. officials said Moscow was only broadening its retaliation against Georgia for trying to take control of the region. The sheer scope of Russia’s military response has the Bush administration deeply worried. Russia on Sunday expanded its bombing blitz in areas of Georgia not central to the fighting. Cheney spoke Sunday afternoon with Georgian President Mikhail Saakashvili, Cheney press secretary Lee Ann McBride said. “The vice president expressed the United States’ solidarity with the Georgian people and their democratically elected government in the face of this threat to Georgia’s sovereignty and territorial integrity,” McBride said. Asked to explain Cheney’s phrase “must not go unanswered,” White House spokesman Gordon Johndroe said, “It means it must not stand.” White House officials refused to indicate what recourse the United States might have if the military onslaught continues. A Russian official said more than 2,000 people had been killed in South Ossetia since Friday; the figure could not be confirmed independently. The president was to end his weeklong stay to Asia by attending a baseball game and other events Monday at the Beijing Olympics. The trip was meant mostly for fun and games — there have been plenty of both. But the fast-moving conflict in Georgia has grabbed his attention. Bush, pressing international mediation, reached out Sunday to French President Nicolas Sarkozy, who heads the European Union. The two agreed on the need for a cease-fire and a respect for Georgia’s integrity, White House spokesman Gordon Johndroe said. In Washington, the chairman of the Senate Armed Services Committee said the United States must work closely with Europe in condemning Russia’s actions. Georgia, whose troops have been trained by American soldiers, began an offensive to regain control over South Ossetia overnight Friday, launching heavy rocket and artillery fire and air strikes that pounded the provincial capital, Tskhinvali. In response, Russia launched overwhelming artillery shelling and air attacks on Georgian troops. “We’re alarmed by this entire situation, and every escalatory step is a further problem,” deputy national security adviser Jim Jeffrey told reporters. The U.S. military began flying 2,000 Georgian troops home from Iraq after Georgia recalled the soldiers following the outbreak of fighting with Russia. The decision was a timely payback for the former Soviet republic that has been a staunch U.S. supporter and agreed to send troops to Iraq as part of the U.S.-led coalition. Georgia was the third-largest contributor of coalition forces after the U.S. and Britain, and most of its troops were stationed near the Iranian border in southeastern Iraq. The risk of the conflict setting off a wider war increased when Russian-supported separatists in another breakaway region of Georgia, Abkhazia, launched air and artillery strikes on Georgian troops to drive them out of a small part of the province they control. Also, Ukraine warned Russia it could bar Russian navy ships from returning to their base in the Crimea because of their deployment to Georgia’s coast. “If those Russian ships leave that port in the Black Sea and if Ukraine decides that it is not going to allow those ships back into that port … that is a potentially much greater conflagration involving a wider regional area,” Levin said. The White House sought to reassure that the administration — including Secretary of State Condoleezza Rice and Joint Chiefs of Staff Chairman Adm. Mike Mullen — were talking to parties on both sides and trying for a diplomatic solution. Bush also tended to relations with China, again raising raised concerns to President Hu Jintao about how the host of the summer Olympics treats its own people. Bush worshipped at a Beijing church and declared China has nothing to fear from expressions of faith. The message had the added punch of coming on China’s turf, as Bush has done before. He managed time for a couple of marquee sporting events. With first lady Laura Bush, daughter Barbara and former President George H.W. Bush, he cheered from the stands of the Water Cube Olympic swimming venue. American Michael Phelps claimed the first of an expected string of gold medals by smashing his own world record in the 400-meter individual medley. “God, what a thrill to cheer for you!” Bush told Phelps afterward. At night, Bush watched the eagerly anticipated U.S.-China men’s basketball game. Associated Press writers Mark S. Smith and Paul Alexander contributed to this report. *Question*: What is Russia’s aim in South Ossetia? *S.Lavrov*: Russia’s aim is to keep peace. This is not just Russia’s aim, this is Russia’s obligation. Russian peacekeepers have been brought there under the agreement between the parties after the war which started in the early nineties. The late President Gamsakhurdia who was the leader of Georgia at that time declared his policy “Georgia for Georgians”. He cancelled autonomies of Southern Ossetia, Adjaria and of Abkhazia. He brought his troops into these areas and then the resistance took place. And Georgian army was wiped out of those regions. It was then that after quite nervous and intense negotiations a peacekeeping mechanism was established comprising Georgians, Ossetians and Russians. The peacekeeping force was established and this peacekeeping force has a mandate. The mandate is to make sure that there is no violation of quiet in the zone of conflict and the peacekeepers are required by this document to prevent any violations and to put out any violations. Since Georgian forces for the second time are engaged in aggressive actions in full violation of the obligations under those international agreements and international humanitarian law by attacking civilians, residential quarters, humanitarian convoys, attacking the convoys trying to remove the wounded from the area of the fighting and even, by some reports, finishing off the wounded. So this is absolutely unacceptable and the responsibility of Russia as a peacekeeper could be only sustained by responding to this aggression. *Question*: Does not Georgia then have the right to control its entire territory? *S.Lavrov*: Absolutely. Absolutely, but Georgia after it attacked, as I said, its own regions in the early nineties, accepted that there would be international mechanisms to keep peace in Ossetia and in Abkhazia but not to perpetuate the situation. In both cases international negotiating mechanism has been established with the participation of Georgia, which unfortunately for the last couple of years the Georgian government has been consistently ignoring and asking for something else. You know that people say now “Let’s announce immediate ceasefire”. But ceasefire was announced two days ago only to be violated by the Georgian forces. The ceasefire is something, which you use when the war has started already. But for the last few months Russia alone has been trying to persuade the Georgian government to deliver on this commitment and to sign a legally binding document not to use force in the Southern Ossetian conflict. 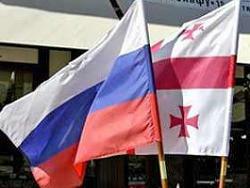 This was an arrangement tempted to be agreed a year and a half ago within the Joint Control Commission between the Georgians and the Southern Ossetians. And then the Georgians violated this commitment and refused to sign such a document&183; Mr. Saakashvili recently said: “It is ridiculous to ask us to do this because Georgia will never use force against its own people. As simple as that.” And unfortunately our western friends who one way or another participate in the efforts to settle this conflict were also reluctant to pressure Tbilisi in order to have this legally binding document happen. *Question*: Mr.Saakashvili’s Administration is very close to the United States. Do you think their closeness in some way took blame for this flare up in the conflict? Do you think the US could have done more to prevent this happening? *S.Lavrov:* You know, I talked yesterday to Secretary Rice and we discussed what we could do, especially since during the last few months’ short of blank pressure on Tbilisi to sign this document, I believe the Americans were trying quite hard to prevent lodge*. * And from indirect information we are getting from Washington we understand that people involved in this issue have been really shocked by what Mr.Saakashvili has started. So we encourage the United States, we encourage the EU members – we talked yesterday to quite a number of colleagues from France, Germany, Mr.Javier Solana, our Finnish friend, who is the head of the OSCE now, and we explained our position. We can not allow peace agreements just to be violated this way. And whatever it takes to bring the situation to status quo ante would be done. You know that peacekeepers are being killed including by Georgian peacekeepers, who used to serve together with them in one contingent and who were supposed to be united by the common goal agreed on paper officially by both sides. *Question*: How far is Russia prepared to go in this quest to restore the status quo? *S.Lavrov*: Mr.Saakashvili keeps saying that we want to chop off part of Georgian territory. He is also saying this is not about Georgia, this is about the future of Europe. He says that Russia is also making territorial claims to other countries, including the Baltic states. This is rubbish because it is exactly the other way around as far as the Baltic States are concerned. Some of them have territorial claims to Russia, at least some politicians of those countries. But Russia wants to sign the border treaty with Estonia which is the last remaining Baltic State, with which we do not have such a border treaty. It is exactly because of Estonian politicians’ territorial claims to Russia that we can not do this. But our goal is very simple. We want to act strictly within the mandate given to the Russian peacekeepers and this mandate provides for the zone of conflict to be freed from any illegal armed groups except for peacekeepers themselves and the zone of conflict must keep the regime of protecting civilians. When civilians at this zone, when the peacekeepers’ forces in the zone of conflict are attacked from outside of course those sides from which the attacks are launched, we should not feel safe, that is for sure. *Question*: So you would pick up targets in Georgia if you feel that is within Russia’s interests? *S.Lavrov*: No, no. I was very clear when I said so. Do not interpret in that way. *Question*: I am just trying to understand. *S.Lavrov*: When the peacekeepers are inside the zone of conflict, the civilians whom the peacekeepers must protect are in the zone of conflict when the civilians’ side is bombed, is shelled from outside the source of this attack must be targeted, so that this massacre is not repeated. About 15 hundred civilians have been killed by some count which is being verified now. At least 15 Russian peacekeepers are dead. Some 50 are wounded. There are reports, as I said, that the wounded peacekeepers are finished off by the Georgians, which is a gross violation of all Geneva conventions and the international humanitarian law. And I would just say that people in Europe, people in the West should not perceive it differently. We had been for last months if not years not only preaching for the signature of this non-use of force document&183; We have also been drawing the attention of our colleagues to the facts of Georgia buying offensive arms in contradiction to OSCE recommendations, in contradiction to the EU recommendations which provide for at least caution in selling arms to the areas of conflict. Offensive arms have been brought to Georgia in very big numbers. Some countries to whom we talked realized the negative potential effect of this action and they stopped it. Some others do not. I do not want to go up to the details, but some countries did so, but some others did not. And as a result of this we have Georgian military budget having increased I think 30 times over the last three years, which is being an all-time record. 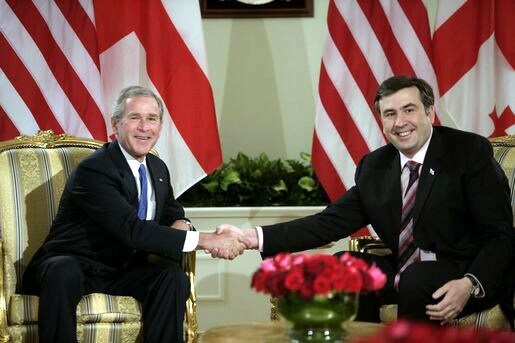 When Mr.Saakashvili says that Georgia by international standards is a number one democracy in the world, I believe that this is still to be checked. But Georgia is for sure number one arms importer of the world. And now we see these arms being put in action to the detriment of all the civilians, many of whom are Russian citizens. And we frankly speaking can not avoid noticing that those who ignored our warnings and who were selling offensive arms to Georgia, those who ignored all warnings and did not impress the need to sign this non-use of force agreement on the Georgian government, I think they should be at least part of the responsibility for what is going on. Especially as Mr.Saakashvili is talking on TV every now and then at the background not only of the Georgian flag, but also of the EU flag. * *I asked yesterday the representative of the EU presidency, whether this was the practice for the EU flag to be used by whoever basically wants to use it and the answer was “no”. I was told that they would look into the legal aspects of the problem. *Question*: You offered passports to the citizens of another countries not just part of a campaign of antagonism you have had to Georgia over last year? *S.Lavrov*: No, no. I believe, they understand the reason for this. When the Soviet Union collapsed, Russia found itself in a very awkward position. Some 25 million people who used to be the citizens of the Soviet Union, overnight found that they are living in a foreign country. And Parliament of the Russian Federation in 1991 adopted the law saying that whoever was a holder of a Soviet passport has the right to become a Russian citizen. And since about the same time the then Georgian President Mr. Gamsarhurdia started this “Georgia for Georgians” campaign and antagonized Ossetians, Adjarians, Abkhazians, they ran to Russia for passports, for citizenship. That is how it started. And when this conflict was brought from the hot phase into the frozen phase, these people were still deprived of elementary social services and as Russian citizens they had the right to be provided with pensions, salaries and elementary things. So I believe this is not something, which is not understood. And when people try to blow this particular aspect of the situation – the Russian passports in Ossetia and Abkhazia – out of proportion, I always remind them about a situation in a different country, in Moldova, where huge proportion of the population is getting Romanian citizenship and the EU is quiet. *Question*: You mentioned there was a sense of shock in Washington on the way that things have developed. Given of this situation is so unpredictable aren’t you concerned you are involved in a major conflict with a country which is a would be NATO-member and a very close-eye of you former cold-war foe, Washington. *S.Lavrov*: If NATO is ready to welcome such a regime in its ranks, it would be interesting to see how this is done. I do not think we are on a brink of a war. We are limited in all our actions to do things. Responsibility to protect our citizens under the Russian constitution and the responsibilities of the peacekeepers to keep this particular case when peace was raped to restore peace. Peace is required and that is what we are going to achieve but we would not go beyond this. *Question*: It is not a secret there has been great antagonism between particularly this country Administration in Tbilisi and Moscow for the last few years. Isn’t it the truth, but you just do not like this regime, you do not like them to join NATO and in this conflict you want to teach them a lesson? *S.Lavrov*: In 2006 what happened was that four Russian officers who came to Georgia to oversee the withdrawal of the Russian military bases, which Georgia wanted so much, were without any reason grossly attacked and humiliated. So if you want us to like people who did it, I do not think we will. If you want us to like people who started this aggression in Southern Ossetia killing Russian peacekeepers, I do not think we would be positively considering the offer. Actually speaking of the current government in Georgia I mentioned the withdrawal of the Russian military bases. I negotiated this issue personally in 2005 with President Saakashvili and at that particular format Russia was saying that we need many years to withdraw. And a lot of money to pay for this withdrawal. And Mr.Saakashvili said to me when I visited Tbilisi in 2005 that he wanted this bases out before his next elections, so that he could present to his electorate the results of the efficiency of his policy. I reported to then President Putin, this was discussed in the Russian Security Council and not an easy decision, from the point of view of domestic audience*,* was taken to withdraw in 2,5 years. Just as Mr.Saakashvili wanted, six months before his elections. And we delivered even in advance, before the deadline the Russian bases were out. In spite of that fact those who were engaged in the withdrawal procedures were grossly attacked and humiliated, as I said, in 2006. An interesting thing is that part of that arrangement which I negotiated was to be delivered by our Georgian colleagues. And the package contained three elements: one – Russia withdraws totally from Georgia, number two – Georgia adopts a constitutional law prohibiting, proscribing the presence of any foreign basis on Georgian soil forever, number three – Russia and Georgia together establish a joint counter-terrorist center, because the issue of Georgian territory being used by people from Northern Caucasus to come and then to go back to Russia – this issue was quite topical. So we withdraw our bases, they undertake not to have any foreign bases and we jointly create counter- terrorist center. These were the three elements of the package. We delivered and they just forgot about their obligations. So we have experience of dealing with this government and I believe we have an objective picture of it. *Question*: Now could this conflict end without further bloodshed? There are reports that more troops are sent in. 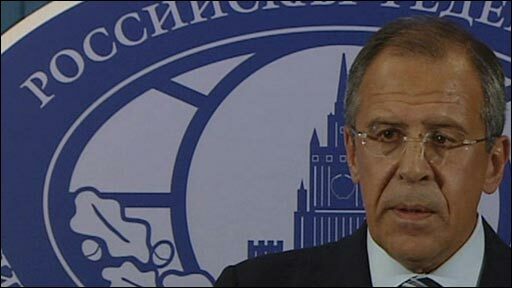 *S.Lavrov*: They have a mandate to liberate the zone of conflict from violators. Whatever it takes we would do. To stop this is for the Commander-in-chief of the Georgian army, to give orders to his troops to withdraw from the area they illegally occupied. Then of course it would be not necessary to use peace enforcement to achieve this goal. And then I would come again to the thing which I mentioned in the beginning that a non-use of force legally binding document with international guarantees would be signed which I would strongly recommend. *Question*: Am I right in understanding you that Georgian army was shooting Russian wounded dead? *S.Lavrov*: Yes. That’s the reports we are getting and we are verifying them. *Question*: So that if this is the case and that is clearly a war crime. *S.Lavrov*: Yes. And the President of the Russian Federation said that those who are responsible for it should be brought to justice and we would be considering using the international law proceedings. P.S. From Tinatin: Let’s just hope for a peaceful resolution and the end to all of this before it gets a little too out of control…..One way or another, that’s all that really matters. I have just received this press release from the Human Rights Watch and since you have all been so attentive and caring in regards to this horrible conflict escalating by the day, I’ve decided to post a copy of the HRW release for those of you interested in both sides of the story…. taking into account the two varying sides only when it comes to the civilians – unjustly affected by this mayhem. New York, August 9, 2008 – Georgia and Russia should not under any circumstances target civilians as the current hostilities intensify in South Ossetia, Human Rights Watch said today. Human Rights Watch, concerned by reports of attacks targeting civilians, called on all sides to respect the absolute ban against targeting civilians or carrying out attacks that indiscriminately harm civilians. 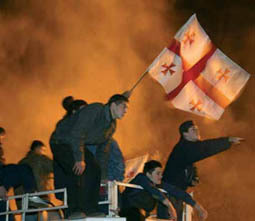 After weeks of low-level hostilities, the conflict in South Ossetia, a breakaway region of Georgia backed by Moscow, escalated dramatically in the early morning of August 8, 2008. Georgia declared that it intended to restore constitutional order and launched a large-scale military offensive. Russia sent additional troops to South Ossetia, saying they were reinforcements to Russian peacekeepers who are in the area to monitor a 1992 ceasefire between Georgian and South Ossetian forces. South Ossetia authorities claimed that Georgian forces used Grad multiple launch rocket systems to shell civilian areas, particularly in the capital, Tskhinvali, and that dozens of buildings were destroyed or damaged, including the university, the hospital, a shopping center, schools, and several government buildings. According to unconfirmed media reports, several Ossetian villages, including Dmenis and Tsunar, also sustained significant damage. Reports on casualties vary widely, with different media agencies citing figures ranging from 15 to 1,400 people killed in South Ossetia as a result of the attacks. None of these reports could be confirmed. According to the Russian Federal Migration Service, 971 people fled South Ossetia on August 8 and sought refuge in North Ossetia, a Russian province that borders South Ossetia. North Ossetian hospitals reported that they were ready to admit the wounded; but the head of the regional hospital was quoted by Kavkazskii Uzel, a news website, as saying that, “the road which was intended for evacuation of the wounded has been bombed,” and doctors did not have access to the wounded. Russia’s military command claimed that 12 Russian peacekeepers deployed in South Ossetia were killed and 120 injured, and also blamed the Georgian side for obstructing the evacuation of the wounded from Tskhinvali. In the meantime, according to the BBC and other international media, Russian tanks have reportedly reached the northern suburbs of Tskhinvali while the Russian air force has been carrying out air raids in South Ossetia and further into Georgian territory. Georgian President Mikheil Saakashvili accused Moscow of bombing Georgian air bases and towns, resulting in the deaths of 30 military personnel and civilians. Human Rights Watch called on both parties to abide by the fundamental principle of international humanitarian law, which requires armed forces to distinguish between combatants and civilians, and between military objects and civilian objects, at all times. It is also forbidden to carry out indiscriminate attacks or attacks that cause damage disproportionate to the anticipated concrete military advantage. South Ossetia was an autonomous province of Georgia during the Soviet era. It declared independence from Georgia in 1990, and armed conflict between South Ossetian and Georgian forces ensued in 1991 and 1992. The conflict ended in 1992 with a ceasefire and establishment of a tripartite peacekeeping force, with Russian, Ossetian and Georgian peacekeeping battalions. The ceasefire adhered, but tensions continued, with Georgia accusing Russia of providing assistance to South Ossetia’s separatist movement. 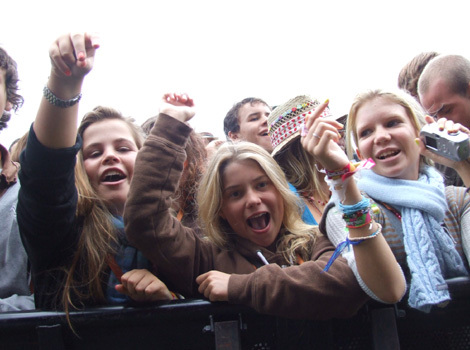 Many people underestimate the value of real human relationships we make with our online “virtual” friends on websites such as Myspace, but at times when that “human factor” is much needed, somehow the line between online and offline friendships is so blurred – it becomes too minuscule a difference. With the most recent escalation of conflict back in my home country, Georgia (Georgia the country, not the state, remember that blog post early on? 🙂 and the growing interest of western media about the events taking place in Southern Ossetia, I – among many, many Georgian expatriates witnessed the genuine concern of the westerners, and in my particular case – the friends that I have recently made on Myspace have really demonstrated such heart-felt support and interest in the current events… It’s staggering and heart warming. Thank you all so much for your sweet messages and concern. Years after Southern Ossetia along with another Georgian region – Abkhazia – declared their independence from Georgia in the mid 90’s, Georgia’s President Mikhail Saaakashvili has vowed to bring both regions back into the fold. Over the past several months, the tensions between Moscow and Tbilisi have increased most significantly and the fighting has intensified – most recently, since earlier this week – even more so, as most of you may already know. World leaders and international organizations, including the United Nations Secretary-General Ban Ki-moon and the UN Security Council, have been actively calling for an end to the fighting in Georgia’s de facto breakaway region, South Ossetia, but unfortunately as we have seen the news unfold throughout the day, the conflict is only escalating at a significant rate. And with governments of Georgia, Russia and the de facto leadership of the de facto region of South Ossetia aside, civilians are truly the ones least deserving of this nightmare. While all parties are eagerly blaming each other, the ordinary civilians are being affected by the fighting not only in Ossetia, but even, for example, in the capital of Georgia – having spoken to my family back home last night, they voiced their worries about the younger male members of my family being forced by this current situation to join the local troops to fight in Ossetia… Scary… And unpredictable…. One wonders if this is just the beginning of something even more complicated and frightening due to all the political mayhem… And who gets stuck in the middle of it? People… People who want nothing more but to live in peace in their own homes with their family members all being well and alive. And thank you all once again, dear friends, for your thoughts and care – being born in Georgia and having moved to Russia quite early on, I can’t help but feel torn and extremely uneasy about this, hoping somehow the international interference brings the right kind of resolution to this newly enraged… No, don’t want to say the word “war”. Keep Yourself from Idols… Should I? “Tell me who’s your role model and I’ll tell you who you are,” someone I have a lot of respect in the world of arts said to me many years ago. I was too young to understand the true essence of what he was trying to say with this pompous-sounding statement, but years later, I realized there was more to it than “who’s style do you prefer and who’s album cover do you dislike”. There’s a famous Russian saying derived from the Bible, I believe: “Don’t make an idol for yourself” (“ne sotvori sebe kumira”) but for whatever reason, it was never a motto I used in my early years. Perhaps it’s for the better – that way, I had taken the time and effort to really delve into every ounce of my favorite artists’ work and artistic being. One of my favorites (not the most loved one, but easily the next one down) was an adult contemporary vocal sensation of the 90’s who became particularly huge in the latter half of the decade onwards – just as I had approached my teens and had definitely decided to pursue a singing career. It was at the time when the internet had a few more years to go before it had hit every single household in Russia in a big way. So album sleeves with credits, fan club and management info’s were the only source for the determined teenager in Moscow. I had barely turned 13 when one day I decided to write to her and send one of her songs I had recorded by myself in my bedroom – something I wouldn’t have done if I hadn’t loved her that much (not a typical “fan” and never have been, for some reason). Believe it or not (and let’s not forget that it was right after Russia’s initial introduction and first steps towards capitalism and westernization), in the middle of our morning class at school, I got called into my Principal’s office: “Your mom’s on the phone” (there were no mobile phones at youngsters’ disposal at the time…) What could it be, I wondered…. “Are you sitting down? You got a letter through the mail… From across the Atlantic…” I couldn’t believe what my mom was saying – it was so surreal, especially living in a rather isolated world detached from the rest of the western hemisphere altogether… And all of a sudden, a letter from the management of someone I had loved and looked up to – needless to say, I was speechless and couldn’t wait to get home from school to see the letter with my own eyes! And there it was…. Beautifully printed with gold font at the top – quite different from our local barely visible print on poor, worn out paper, that’s for sure! The sweet note was signed by a direct contact at the management company who also happened to be related to the artist herself and whose name (being a die-hard fan) was very familiar to the 13-year-old. It was so overwhelming – I decided to keep the letter (and have done so, in fact) and promised myself that one day I would work with the people who had been directly involved in making her records that I had played over and over again and sang along with enthusiastically in our little Moscow apartment…. There’s something inexplicably satisfying in the very knowledge that I have indeed kept the promise made to my 13-year-old self. And although the dream is still a journey and a reality in the making, it makes me feel immensely warm deep down whenever I remember literally obsessing over the little details and bit and pieces of what is now my life – my very own career that seemed like a faraway dream back then, although there are still miles and miles to go before it’s fully achieved. As for the artist mentioned above, I watched one of her latest “behind the scenes” sessions the other day and I have to admit, it was a truly disappointing sight. Having lost her charisma and artistic honesty completely, I thought I was watching an ultimately fabricated and calculated show – and if that’s what they call “behind the scenes”…. Wow. It is a shame that anyone who makes it THAT big is expected to “lose it” and become totally alien to the very notion of reality – they are always expected to lose their sense of being a part of something larger and more important than their own persona. It’s as if they live on a different planet altogether where the rest of the universe revolves around them. Unfortunately, more often than not, that’s precisely what happens. As Maria Callas used to say, an artist’s responsibility is to serve something bigger than himself/herself – the art. Except it’s usually the other way around in this day and age of the showy show business…. Music serves the artistic ego and not vice versa. The other day, a friend of mine from London sent me an email attachment with a subject that read, rather pompously: “Globalization”. On the contrary to my initial gut feeling, the video proved an ultimate proof that globalization is, indeed, a phenomenon which is growing by the day – both online and offline. As you all know, back in the USSR, the Soviet Red Army was quite famous for its impressive (mainly in size) official choir composed of soldiers turned into musicians and vice versa. 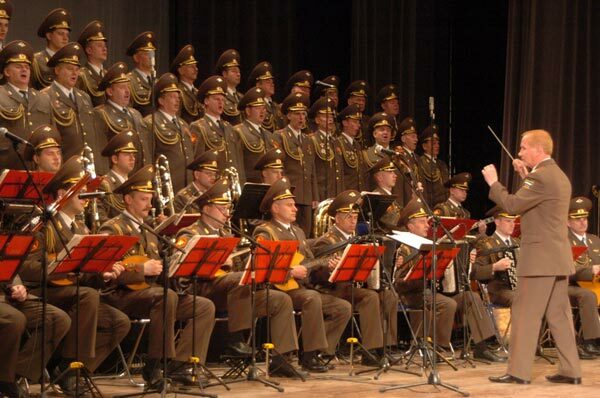 Even in the 21st century, many years after the Soviet regime collapsed, the Red Army choir is still going strong, performing extensively nationwide to this very day. Having imagined a very Sovietsky-looking army choir consisting of nicely groomed musical soldiers of the Red Army, how one mixes that group with a Finnish rock band called The Leningrad Cowboys is quite a stretch, no doubt. Not long ago, The Leningrad Cowboys (remember how Leningrad was initially called St. Petersburg, way before our time, and in the post USSR climate was reversed back to the same identity?) held a concert in Russia for a screaming group of Russian teenagers. As a special “patriotic” flavor for the crowd, they invited the Red Army Choir to join them on stage for a special performance of a VERY unexpected number… “SWEET HOME ALABAMA”!!! As “To the Point News” agency suggested, one couldn’t have made this up – no way! To see this spectacular video, do make sure you click on this link!